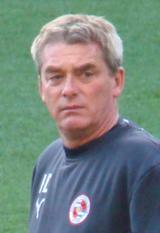 BBC Radio Surrey have reported that Kevin Dillon will be the new manager of Aldershot Town. Dillon, who has midfield playing experience with Birmingham City, Portsmouth, Newcastle United and Reading and gained one cap with the England U21 side. He was the First Team coach at Reading for a number of years as well as being the Reserves manager and he also took on the caretaker manager role for a short spell in 2003 between the resignation of Alan Pardew and Steve Coppell taking charge. During his time with the Berkshire club, he helped them to the Championship title but he left the club along side fellow coach Wally Downes, in May 2009 following the clubs failure to gain promotion back in to the Premiership. The 49-year-old watch on from the South Stand away seats today as The Shots gained revenge against Bury following a 2-0 victory.